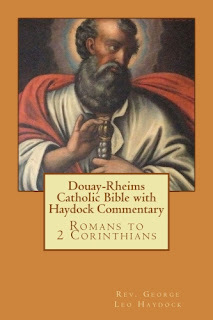 This Catholic commentary on the New Testament, following the Douay-Rheims Bible text, was originally compiled by Catholic priest and biblical scholar Rev. George Leo Haydock (1774-1849). This transcription is based on Haydock's notes as they appear in the 1859 edition of Haydock's Catholic Family Bible and Commentary printed by Edward Dunigan and Brother, New York, New York. After the Gospels, which contain the history of Christ, and the Acts of the Apostles, which contain the history of the infant Church, we have the Epistles of the Apostles. Of these fourteen have been penned on particular occasions, and addressed to particular persons, by S. Paul; the others of S. James, S. Peter, S. John, and S. Jude, are called Catholic Epistles, because they are addressed to all Christians in general, if we except the two latter short epistles of S. John.